Looking for a quality general dentist in Austin? At Hedgecock Dental, our goal is to help our patients achieve optimal health and wellness, and hopefully, maintain it for life! Sometimes disease and decay are beyond our control, but we promise to equip your toolbelt with the knowledge, the resources, and the support and care you need for your healthiest defense. While most days of the year your oral health routine falls in your own hands, we highly recommend coming to see us every six months for cleanings and exams. Only we have the tools and the technology to remove pesky tartar buildup and ensure we catch any small problems before they progress. Schedule a cleaning and exam with us today! How often do you brush your teeth, and for how long? How often do you floss? These are questions you may have been asked at your regular dental visits before, because daily oral hygiene really is the foundation for oral health. Think of it just like exercising or eating a healthy diet. It may not be the most enjoyable activity, but it is a necessary one if your ultimate goal is health. If you’re wondering about proper brushing and flossing techniques, we would be happy to give you a tutorial and our best advice for optimizing your hygiene routine. If it’s time for a professional cleaning, you can sit back and rest assured our hygiene team has your back. Our hygienists are friendly, non-judgmental, and gentle for a stress- and guilt-free cleaning experience. Gum disease is a bacterial infection, and its impact can go much deeper than the health of your gums. 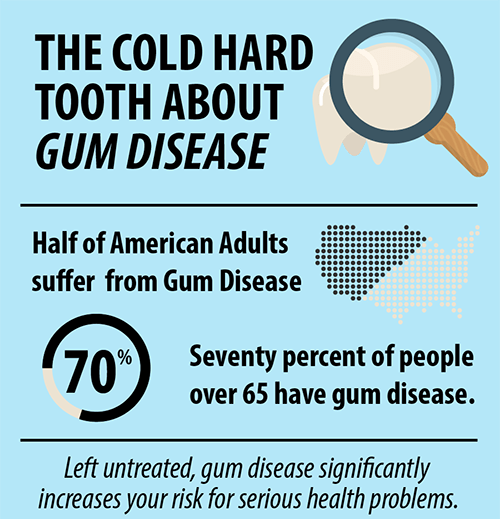 Over time, left untreated, gum disease can cause tooth and bone loss, as well as increase your risk for serious systemic issues including heart disease, stroke, diabetes, and Alzheimer’s. The same bacteria that cause gum disease have a direct pathway through the gums, into the bloodstream, and straight to your vital lifelines—your heart, your brain, and the rest of your organs. If your gums bleed when you brush and floss, your gums have started to recede, or you notice chronic bad breath or other signs of infection, you should come see us right away for a periodontal exam. A large majority of the American adult population suffers from gum disease, and many of them don’t even know it, but you now have the knowledge to notice the warning signs and seek treatment. Hedgecock Dental gum disease treatment options include scaling and root planing (deep cleaning), Arestin® antibiotics, and Oral DNA bacterial testing. Severe cases of periodontitis may be referred to a trusted periodontal specialist in our network. You’ve probably had at least one dental filling in your life, maybe when you were a kid, or maybe more recently. You may even still have remnants of old metal fillings lurking in your molars. Metal amalgam was the “gold standard” for fillings and dental restorations for most of dental history, but in recent years, we’ve developed materials that are safer, more durable, and blend in seamlessly with your natural teeth. Tooth-colored fillings are completely safe for the human body, so you don’t have to worry about any toxic mercury. Tooth-colored fillings are designed to withstand temperature changes, so they won’t expand and contract like metal fillings can. The most obvious benefit of tooth-colored fillings is, of course, their tooth-colored appearance, so we can stop decay and restore your tooth without compromising the look of your natural smile. 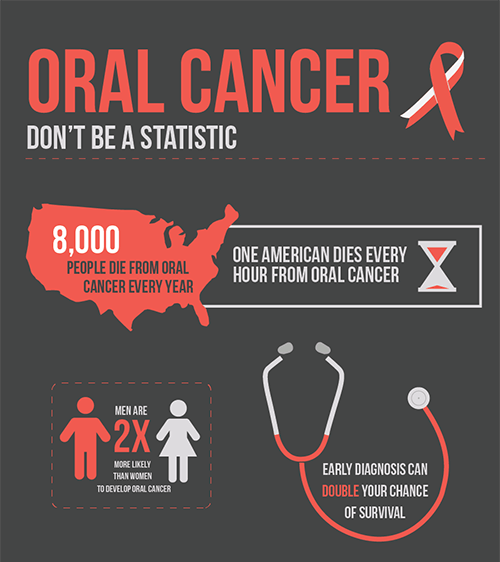 Oral cancer is one of the deadliest forms of cancer because it’s usually not detected until its later stages, when it’s often too late. Oral cancer rates are on the rise in the United States, and now, HPV outweighs both tobacco and alcohol consumption combined as the leading risk factor for oral cancer. Most sexually active adults will contract HPV at some point in their life, making regular oral cancer screenings even more important. You should be aware of the signs, symptoms, and risk factors for oral cancer, which you can learn more about in our infographic. At Hedgecock Dental, we are always on the lookout for any abnormalities that may be signs of oral cancer, so you can have peace of mind. But the only way for us to catch it in the early stages is for you to come see us regularly for cleanings, exams, and oral cancer screenings. Your healthy, natural smile is one of your greatest assets, whether you realize it yet or not! It’s one of those things we often take for granted until it’s compromised or lost. 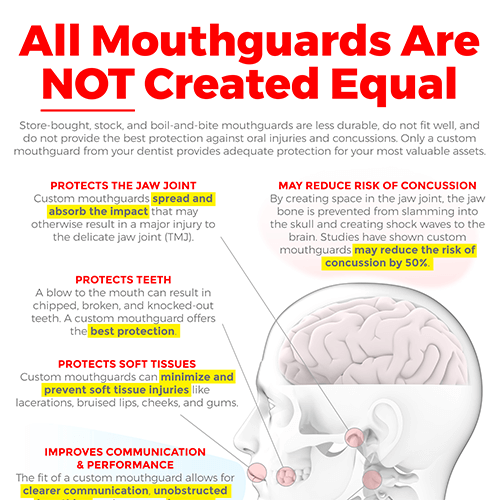 That’s why we’re happy to provide custom mouthguards for the star athlete in your family, and custom nightguards for those who clench and grind their teeth at night. While the look and feel of sports mouthguards versus nightguards is different, the purpose is the same—protection! Hedgecock mouthguards are custom-made to fit your unique smile, so they are more comfortable to wear than stock or boil-and-bite mouthguards, and even provide clearer communication and better breathing on the field—and can even minimize damage from concussions! If you suffer from bruxism or TMJ, a custom nightguard can provide a soft cushion and protect your teeth from being worn down over time. We hope to smile with you soon! Schedule a visit with your Austin dentist, Dr. Brandon Hedgecock at Hedgecock Dental today!